The lawn is a large, open green space, surrounded by a walking loop. Whether you're up for a jog, playing a game of tag, or looking for a shady spot to read a book, the lawn is the perfect place. 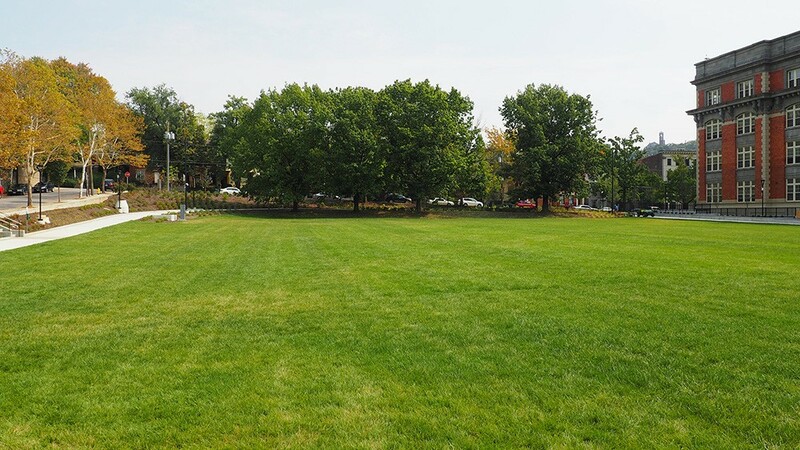 Located just north of the recently completed Alumni Lofts, the lawn is a multi-purpose area that can be used for passive or active recreational activities for both individuals and groups. This two-acre green space, which comprises the east portion of the park, is situated directly above the park's new 400-space underground parking garage. It is connected to the rest of the park through the Wayward Crossing, a pedestrian walkway highlighted by traffic calming features that crosses over Sycamore Street.